Doing primary care well requires not only the technical know-how of medicine but a heart for the individual relationship. Sentinel Primary Care is proud to donate a portion of our care to those who lack access to medical care because of financial hardship. Our mission to provide quality primary care flows from the Christian heart of the practice to love God and to love our neighbor as ourselves. Regardless of finances everyone has God-given human dignity, and we donate a portion of our care in service of that dignity. At Sentinel, we understand that medical care differs from community to community. By donating a portion of our care to uninsured patients in our own community and by working with a local church to provide an on-site free clinic for uninsured patients we provide the top-notch primary care that people need to treat their illnesses and improve their quality of life. We are a 501(c)(3) nonprofit organization and welcome your financial contributions to support our mission. Our donated services are supported by private donations, and we do not accept federal or state funding. In order to receive donated services from Dr. O’Connell, patients must be uninsured, go through our new patient screening, and have a household income that is less than 300% of the U.S. Department of Health & Human Services Federal Poverty Guidelines. For more information, review our eligibility requirements. You can support us in two ways. 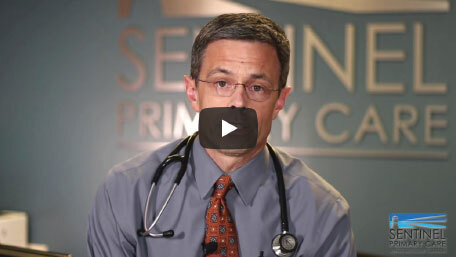 First, you can make a tax-deductible contribution to Sentinel Primary Care. Second, if our charitable care spots are full, you can sponsor an uninsured individual who is on our waitlist so that he or she can join Sentinel Primary Care as an annual fee member. By paying an annual membership fee on behalf of someone who can’t otherwise pay, you’ll give them immediate access to the full primary care services of Sentinel Primary Care. Sponsorships may be tax deductible. Remember to speak with your tax advisor about your particular circumstances. We’d like to invite you into our office for an initial visit to meet Dr. O’Connell and learn more about the Direct Primary Care model. When you become a member you’ll gain access longer office visits with Dr. O’Connell, quick access for acute needs, and much more. At Sentinel Primary Care, it is our goal to promote health and good living in all of our patients. Let’s craft a comprehensive health plan for you together as you enjoy convenient access to top-notch care via in-person and video visits, email, phone, or text. Schedule your initial visit with Dr. O’Connell today!